Woocommerce product feed manager v1.9.4 is now available via automatic update and the downloads page. This is not only a maintenance update that includes bug fixes but also includes added functionality and user improvements..
We recommend users update as soon as possible in order to keep your product feeds up to date with the latest bug fixes, security enhancements and feed requirements. I have created an example code on Github so you can have an idea about the working and posibilities. We have several customers that use the woocommerce composite products to create product kits and complex products by grouping existing simple or variable products. Our plugin will now support that plugin and will work with this type of product. In some cases we found out our clients need support of custom taxonomies. As of version 1.9.0 our plugin will pick those taxonomies up and list them in the source dropdown in the feed manager. So for example if you create a gender taxonomy for you products you will be able to add the gender to the product feed for each product. Until now we did not support the Adwords remarketing tags. But because Dynamic remarketing is such an important part of any online marketing strategy we have included the attributes to the google shopping feed template. The functionality above are the most important updates but there is even more and in the change log below you will find every bit of improvement and added functionality in our new 1.9.4 version. 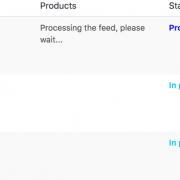 Do remember to go and update your product feed manager plugin and also keep an eye out on update in the channel manager if you have the Product feed manager E-commerce version. Channel templates do get updates so your product feeds keep being valid in the channels where you show your products. We are very proud of our Product feed manager for woocommerce. It has been grown to an advanced product feed manager with some awesome feature sets that will make your product feeds get the most out of your listings in shopping channels. Today we release an other update with great added functionality to help you create awesome feeds. Let me list the important ones. 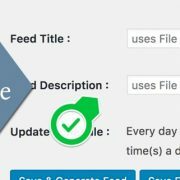 You can now add a feed title and Feed description to your feed. Normally this was set to the feed file name you gave it in the settings. So now you can have even more controle and add a custom feed title and custom feed description that will be displayed in the product feed file. When you created a feed and set the update time this would in previous version only be activated the day after the update. In this new update the schedule will be effective right after the you updates the feed and independent of the manual update. So when you update the feed on 13:00 hours and the automatic update is set to 23:00 hours it will execute this update on the same date. Before it would wait for the next day and now it more like one would expect it to behave. One other request was to have the possibility to save the feed without updating the feed file. So in the feed manager you will now find two buttons one to save and generate file and an other button that will only save the feed. This added functionality will improve the support of other plugins greatly. 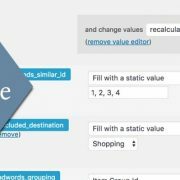 There are a lot of plugin that will create custom product fields and are useful to use in the attribute mapping of our plugin. Because of the plugins all user there own naming convention it is nearly impossible to support all kinds of plugins. But we have found a nifty way to let you set the prefix of the id of the custom product field the plugin uses. You will have to do some research yourself though. First check out if the custom product fields are not already listed in the Attribute mapping tool. If not find out what the plugin is using as an ID in creating their custom product fields. You will have to look for functions like woocommerce_wp_text_input() The id in that function will reveal the used prefix. In our little helper plugin for additional product identifiers we use id’s like _wpmr_gtin where _wpmr_ is the prefix. If you have found the prefix used in the third party plugin you can add this in our Third Party Attributes field witch you will find in our Settings section of our plugin. The settings will be saved automatically and you will find the custom product field in the attribute as source. As you can see there are some great added functionality. Please make sure your update your copy and start using the new functions in our plugin. Woocommerce product feed manager v1.5.1 is now available via automatic update. This is a maintenance and bug fix release. Like with all our plugin updates and especially those that include Channel updates, we recommend our users update as soon as possible. We have added three new Channels and updated the Google with some big changes. Because of this big change in the Google channel you will need to update your google channel before you are able to create new feeds. If you find any issue with your older feeds please update your channel templates! Note: if you have the Google Feed Manager you have only the google channel and do not have to update your channel.